Yes! 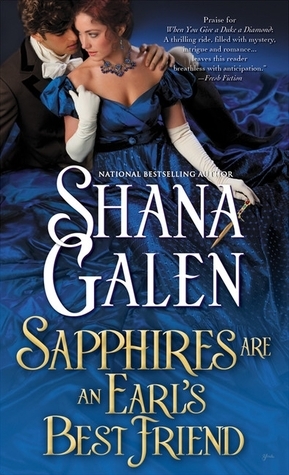 Sapphires are an Earl’s Best Friend is Regency rife with romance, risks, rage, and risqué romps—perfect for a book in the Diamonds series by Shana Galen. Lily Dawson, the Countess of Charm, is one of the Three Diamonds know in London Society as courtesans and Impures. They keep their secrets well just like Countess Sinclair taught them. They have a certain reputation yet still influence styles and manners in many ways. The other two Diamonds, Fallon and Juliette have found their happy-ever-after with men of note, but Lily continues her work as a spy for the Crown. She uses her training well and takes the reader right along with her as she (so to speak) steps into the lion’s den to find the traitor that plots to get the elite super spies called the Diamonds in the Rough assassinated. Lily knows her way about the mean streets of London. She’s been there and survived the worst, but at Ravenscroft Castle (the lion’s den) she is walking a tightrope as she searches for evidence, charms the disgusting old Duke of Ravenscroft, and tries to get passed her longtime love for the Earl of Darlington, the old Duke’s son. If you’ve read the two previous books in this series, you will probably remember how Lily has felt about Andrew, the Earl of Darlington, and that he only had eyes for Juliette, one of the other Diamonds. Since I’d read the two previous books, I was eager to get to this one. Shana Galen does not disappoint. Sapphires are an Earl’s Best Friend sparkles, shimmer, and shine with intrigue, danger, suspense, humor, and LOVE. Andrew, Earl of Darlington, has sown his wild oats in London Society, has pined over Juliette, and is now faced with his emerging feelings about Lily who has an agenda that could ruin his family name or maybe even worse—send the Crown into a rage over Andrew’s family’s activities. All at once, he has some ‘grownup’ issues to face since he will one day be Duke of Ravencroft. When Lily and Andrew get entangled with two evil, desperate antagonists, there is breath-holding, goose bump raising action. The sensual, caring love scenes show a new facet of both Lily and Andrew’s personalities that is new to even them. The reader gets a special vicarious experience as both the hero and heroine discover what true love is. Shana Galen writes Regency romance with just enough setting to keep the reader grounded in the era. She creates characters that bring the history to life as they make their way through the uneasy times. Her unique, compelling writing style propels the reader along with the characters as they weave their way through twists and turns of events, both good and bad, before the hero and heroine find their happy-ever-after. Suspenseful, superb entertainment!